The main use for the gas at first seems to have been for public street lamps. In the records of the Thornbury Gas Company there is a note that the payments for the period up to 20th February 1857 include pipe fitting and masonry for public lamps. The lamps were supplied by Stothert and Pitt the engineers in St Philips, Bristol. These public lamps quickly made some income for the new company. By December 1857 the income section of the ledger shows that £20.00 in rent for the public lamps was received – less £1.10 due to Mr King for collecting rate. The gas consumed was 351,200 cubic feet. How many public lamps there were at the beginning is not clear; we believe there were twenty-three. The first detailed list of the lamps that we have found so far was dated 1920. Even that has only twenty-five lamps and one extra on Sundays; nor were they to be lit every night as “five nights in each month viz;- two days before full moon and two days after” there was apparently enough natural light anyway. 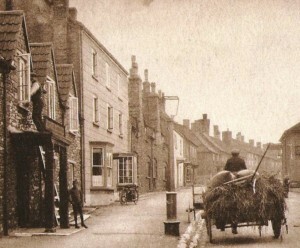 The lamps were; in the High Street at Mr Chambers, Mr Thompsons, G.B. Symes, Ted Ponting, F Williams, the Register Office and The Plain (2) (see above); in Castle Street at Dr Williams, Chantry, Kington Corner, Vicarage Wall, The Church; in Gloucester Road at F K Howell, Grammar School (now Castle Sixth Form Centre), Mr Pitcher’s. Others were the Weighbridge (The Plain), Porter Stores (The Barrel), Lodging house, Bath Road, A Riddifords (Horseshoe Lane), Murray’s (Gillingstool Hill), Cullimore’s Entrance and Saw Mill Lane. Some of the wealthier families in Thornbury also had their own lamps installed. We are not sure when they began to appear in people’s houses but by 30th June 1858 “house services” are referred to. There is also a note in the accounts book that by December 1860 there was a lamp at Mrs Churchell’s gate. Mrs Churchell lived at The Parks which adjoined the Castle grounds. This lamp was supplied by Hall and Pedder for 9s 6d. Thornbury Museum has the heading from an early gas bill dated January 1871 sent to Henry Howard at Thornbury Castle. The Churches seemed to benefit too. The parish records of St Mary’s Church say that gas was the first used there on Christmas Eve 1856. The level of the supply of gas caused complaints in Thornbury for many years. We have found an early example of this in the records of what was then the Congregational Church but is now known as the United Reformed Church. The minutes of the November 1886 meeting refer to the “bad lighting of the premises” because of “the provision made years ago for lighting.” The upper schoolroom was said to be useless in winter because of this problem and the pastor was asked to make a formal complaint to Thornbury Gas Company. In Gloucester Records Office there is a letter to Thornbury District Council from the Thornbury Gas Light & Coke Co Ltd dated August 1st 1901. It arranges to supply gas from “1st day of August 1901 to the 31st day of May 1902” – excepting of course the five nights a month that are too light to need gas light – for £115. This document makes clear the type of gas lamp the company provided; “the ordinary batswing, consuming five feet of gas per hour at ten tenths pressure.” “Batswing” burners were introduced about 1816 and became the typical gas burners of the mid nineteenth century. They had a slit opening which produced a broad flat flame providing a comparatively dim yellowish light of 27 candlepower. In the 1920’s old industries like coal were declining. British technology had not kept up with the times and production methods could not produce good quality materials at a reasonable price. In 1921 sales of coal were so poor that the employers cut the wages of miners. The Gas Company must have ceased production altogether for a time. The Gazette of 30th July 1921 reported that the supply of gas had been resumed. The Gazette of 24th December 1921 published the correspondence between the Clerk of the Council and the Secretary of the Gas Company to show that the resumption of gas supplies had not been the end of the problems. The clerk wrote; “Dear Sir, Complaints were made to the District Council of the quality of the gas supplied in the Street Lamps and of the state of the Street Lamps which, it was reported, had not been cleaned for nearly two months.” Samuel Fudge the Secretary of the Thornbury Gas Light and Coke Co replied to this, agreeing to have the lamps cleaned immediately but denying that the quality was poor. The slump seems to have continued and even worsened. In October 1926 the Gazette announced that under the Coal Emergency Order section 6 part 8 public lighting had to be reduced to a minimum. The Coal Controller had consulted with police sergeant Lawrence and could only authorise five lamps to be lit in Thornbury;- one in Pullin’s Green, one at the Old Bank in the High Street, one the Westminster Bank in the High Street, one on The Plain and one in Castle Street. It seems that Sergeant Lawrence had not felt that St Mary Street and Rock Street needed any lamps at all. 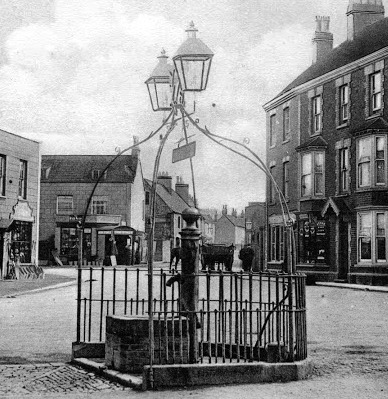 After further discussion the Council agreed to have a sixth lamp – outside the Post Office in the High Street.